Got my PDQ today. Boots into MacOS 9 and doesn't boot (with BootX) into some installed Ubuntu. We can fix that :-). Popped-in my PCMCIA CF adapter with the debian installer files and iQUIK installed. OpenFirmware 2.0.1 is the same version as on the 3400c, but refuses to see anything beyond the PC card bridge. You can setenv boot-command to be my-boot now. ...of course, you may have a different name of the actual CF device. Mine was made by Sandisk, hence the 45,401. Linux loads file, then screen goes psychodelic with the LCD obviously driven incorrectly. Still working on the "real" fix, but you can convince Linux to just use the OF framebuffer instead of re-initing the video with "video=ofonly video="offb". Yes, you need both. This PDQ is a pretty nice machine. 400MHz G3 and 512MB RAM. It's pretty usable even in 2013, which is pretty damn quick for a machine made in 1998. Of course, back in '98 it probably cost a kidney. Trying to boot up a 2.6 kernel with initrd on the 3400c I ran into a couple of bugs that were show stoppers. One resulted in the kernel not finding it's initrd image ("VFS panic"), the second in a hard hang probing a non-existing media bay ATA. To understand the first bug (and the workaround for both) we need to see how the OFW structures are used in kernel bootup. On PowerPC, the Linux kernel can be called anywhere. The early boot code is capable of running at any address (it is reloc-safe), but the kernel needs to be moved to its linked address before it can be run. Of course, the linked address might conflict with OFW mappings, hence the early boot code needs to exit the firmware services before relocating and jumping to the rest of the kernel. Of course, the rest of the kernel needs the device tree information to initialize the platform, and because OFW has been already quiesced, the early boot code needs to make a copy of the device tree structures, thereby "flattening" it. 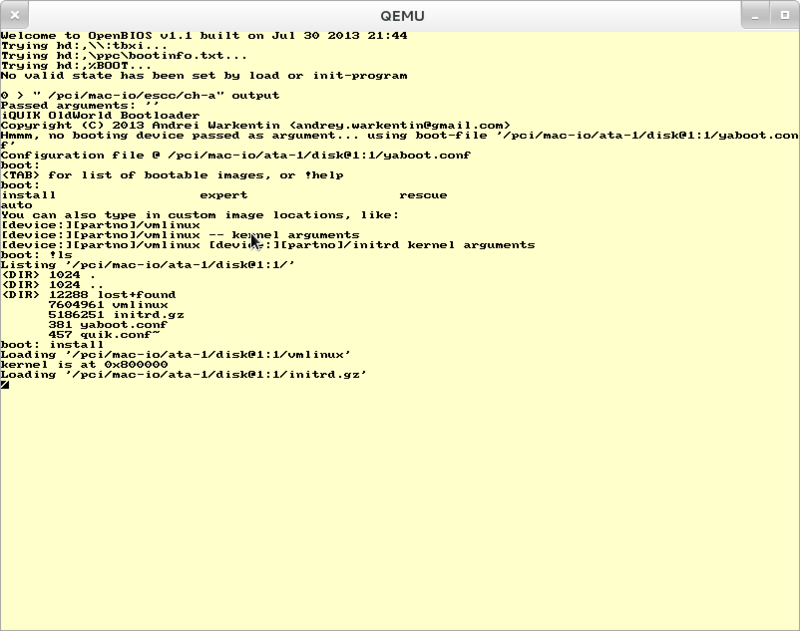 This early OFW-handling code is called from kernel/head_32.S and is in arch/powerpc/kernel/prom_init.c(prom_init). Before flattening the device tree, prom_init first queries various bits and pieces and uses the OF setprop call to store them inside the /chosen node. The /chosen node represents information passed from OFW to the OS, and Linux sets properties in that node for itself to find later. For example, the initrd information (base and size), which is passed in registers to the kernel from the bootloader, is then stored in /chosen/linux,initrd-start and /chosen/linux,initrd-end. This information is then copied using the OFW getprop call when the dt is flattened later inside prom_init. The problem on the 3400c with OFW 2.0.1 is that the setprop client call doesn't actually make a copy of the data, but just stashes the passed pointer away. Because the values set during calls from prom_init are built on the stack, the later getprop calls during dt flattening return garbage. Come to think of it, it's highly likely older OF versions (like the infamous 1.0.5) have the same bug. The second bug involved a hard hang scanning the media bay ATA controller on the 3400c. I don't have a CD drive, so I have no idea if this only happens with the bay empty. There are no kernel parameters to black list devices. Since we already have a shim to intercept and transform OF client interface results, I simply have hidden /bandit/ohare/media-bay/ata away from the kernel. About three quarters of a year ago I found a PowerBook 3400c in the trash pile at work. Given my ongoing nostalgia for PowerPC and OpenFirmware, I couldn't pass up the opportunity to reminisce with this PowerBook. It is by far the oldest mac I've had. The UMAX S900 I dumpster dove for back in 2002 was a dual 604e. This baby is a 603ev. That's three generations behind my old G4 iBook. It's OF is slightly less broken than 1.0.5 on the S900 - at least it doesn't default stdio to serial, and doesn't need nvramc patches to boot from disk. The 3400c booted into MacOS, but clearly it was asking for Linux. I guess I have an odd fascination with obsolete hardware. I've decided to take ownership of the QUIK code, fixing many of its bugs and limitations. The effort is now called iQUIK and is available for everybody at https://github.com/andreiw/quik. iQUIK is a Linux bootloader for "OldWorld" PowerMacs. "OldWorld" PowerMacs are all machines that have OpenFirmware, but that don't have built-in USB. Due to a lacking firmware implementation, the typical Yaboot bootloader cannot be used on "OldWorld" machines. You can install the boot loader on any medium, including floppy. Initrd image work fine, as do 2.2., 2.4 and 2.6 kernels. Can boot any kernel/initrd/argument combos without a quik.conf. Can list filesystems (only ext2 supported at the moment). Works around OF/hw bugs with an innovative shim layer. At least the many bugs on the 3400c. Single-stage installation for robustness, using partition-zero boot block and bootstrap partition.No more LILO-style block maps. You can see the fairly exhaustive documentation at https://github.com/andreiw/quik/blob/master/README. It's only really been tested on a 3400c, although I'm getting a G3 PDQ (that's the last OldWorld PowerBook!) for testing soon. ...but that's not what I wanted to write this post about. I was curious if I could boot iQUIK successfully with the QEMU PowerPC system emulator and OpenBIOS. Turns out yes, but it's a bit painful. The problem is that OpenBIOS doesn't support the mac's "partition-zero" booting, e.g. How does "partition-zero" booting work? The mac partition table contains a structure that describes the disk offset of the bootloader, its size and where to load it. The bootloader has to be plain binary (i.e. not XCOFF). iQUIK leverages this by copying the boot code into it's own partition and setting up the boot descriptor in the partition table to point to it. http://www.opensource.apple.com/source/bless/bless-11/README.BOOTING is a pretty good document that describes this more in-depth. 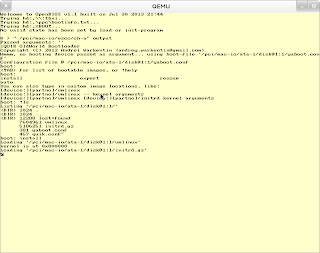 So how to boot on QEMU, then? We could cheat and load the non-munged ELF file the boot code is created from, but I don't have my 3400c nearby to compile with. Instead we will convince OpenBIOS to load our code just like a PowerMac would. You have floppy.img from the github quik/distrib. Note: take the 'initrd-size' out of yaboot.conf file you downloaded above. At the "0 >" prompt in the framebuffer window we type the following commands to switch the firmware to serial port for input/output. You might wonder why we couldn't use the "prom-env" option to set output-device and input-device? It doesn't work. Heh. \ the second ATA disk (-hdb), first FAT partition. \ OpenBIOS doesn't know how to parse the MAC "partition-zero"
\ image is the first parition (wonky indexing... yes). \ I don't really understand why OpenBIOS needs the seek to 0. 0 " seek" ih $call-method . load-base size " read" ih $call-method . \ /chosen/bootargs but iQUIK can handle the inconsistency. You should now see iQUIK in the framebuffer window (not the serial, because we haven't set the input-device and output-device env variables). You can press the tab key to show the boot labels available. Just press enter to boot the default 'install'.